Apostolic Revelation: Role of Women in LIfe and Ministry! Role of Women in LIfe and Ministry! 1) In the ministry of Jesus many women provided for the ministry financially (Luke 8:2-3). 2) Mary and Martha worshipped and served Jesus (Luke 10:38-42). 3) The disciples continued in prayer obeying the Lord’s Word to tarry (Luke 24:49; Acts 1:8; 1:14). Here in Acts 1st chapter, the Disciples continued with one accord in prayer and supplication along with the women (v8) [these women were also waiting to receive power to be a witness in all the earth like Mary the mother of Jesus and other’s like her who were closely associated with Jesus and who were His disciples]. 4) God makes no difference in pouring out His Spirit upon all flesh [that includes all the women (Acts 2:17)]. God also says that as a result of pouring out His Spirit “Your sons and daughters shall prophecy...” which implies God Himself equally considers both His sons and daughters to be equal recipients of His Spirit. 5) But look visions and dreams are with authority and responsibility and it is of a higher order and it is given to individuals as He wills. They are not divine entertainment from God and it is only given to young men and old men [Note: It is gender specific as described in the Word of God]. These are leadership positions where authority is exercised over other men (v17). 6) To serve God with the gift that God has given is not gender specific, because He calls His servants as “My menservants…” and “maid servants” in Acts 2:18. The main work they will do equally with men for God is"prophecy” (1 Corinthians 11:5), but under the authority of the local minister of God who has been appointed by the Holy Spirit. The main area where they will minister [prophecy and teach]individually and collectively is more to women and can minister to the church as a whole in this area (Titus 2:4). 7) Here the Greek word used for ‘to teach and admonish to be sober or soberminded’ is sophroniz, which denotes "to cause to be of sound mind, to recall to one's senses;" in Titus 2:4, RV, it is rendered "they may train"(AV, "they may teach ... to be sober," marg., "wise"); "train" expresses the meaning more adequately; the training would involve the cultivation of sound judgment and prudence. 8) To prophecy is to edify, exhort and comfort men [i.e. the church] (1 Cor 14:3). He who prophesies edifies the church (1 Cor 14:4). If apostle Paul did not want the women to speak at all in the church, he would have never instructed women in the church to cover their head while prophesying in the church (1 Cor 11:5). Here the Greek word used for prophesying is propheteuo, the same that which is used for men speaking forth Divine counsels of God in the church. 9) Propheteuo "to be a prophet, to prophesy," is used with the primary meaning of telling forth the Divine counsels, e.g., Matt 7:22; Matt 26:68; 1 Cor 11:4,5; 1 Cor 13:9; 1 Cor 14:1, 3-5, 24, 31, 39; Rev 11:3; and of foretelling the future, e.g., Matt15:7; John11:51; 1Pet1:10; Jude 14. 10) Tabitha was full of good works and charitable deeds which she did by exercising her gifts of giving with liberality and showing mercy with cheerfulness (Acts 9:36; Romans 12:8). This gives us an idea that women are equally gifted in various things as men in the kingdom of God. 11) God was also moved equally by the prayers of the faithful women who prayed as a group. He moved on behalf of their prayers and intervened in Peter’s life by bringing him out from the prison (Acts 12:12-14). How do we know that women were involved in the prayer? Because it is mentioned in Verse 12 that Peter came to the house of Mary the mother of John Mark and the person who came out of the prayer group to open the door was a girl named Rhoda (v13). 12) Philip the evangelist had four virgin daughters’ who prophesied (Acts 21:9; 1 Cor 12:7-11). Here also the Greek word Propheteuo is used for the activity of ‘Prophesying’ that they did, implying that there is no difference in the content of message that came directly through Divine inspiration from God to the Church. 13) Paul wrote in His letter to the Romans about, “Phoebe our sister, who is a servant of the Church in Cenchrea.”(Rom 16:1, 2). Here Apostle Paul himself calls Phoebe ‘a servant of the Church’. [Note: Paul is calling Phoebe a servant of the Church implying that she was an active participant in the life and service that the Church offered to people]. 14) Junia was a Christian woman at Rome, mentioned by Paul as one of his kinsfolk and fellow prisoners along with Andronicus, who are of note among the Apostles (Rom 16:7). Paul says that both of them were in Christ before Paul himself which shows that they were elderly persons, seasoned and mature in the Lord for years. Here we see a woman apostle, and that too was noteworthy and stamped among the apostolic community. This shows that woman can be an apostle to the church, but should be very elderly and mature in their walk with the Lord not the young and novice women (Titus 2:3-6; 1Tim5;14). 15) Here Paul has used the Greek word sunaichmalotos for ‘fellow prisoners’ to describe Junia the woman apostle and Andronicus [a man apostle], which means "a fellow prisoner," primarily "one of fellow captives in war" (from aichme, "a spear," and haliskomai, "to be taken"), Rom 16:7; of Epaphras, Phm 1:23; of Aristarchus, Col 4:10, on which Lightfoot remarks that probably his relations with the Apostle in Rome excited suspicion and led to a temporary confinement, or that he voluntarily shared his captivity by living with him. Apostle Paul used the metaphor of a fellow prisoner to describe only those co-workers who worked with him and were sold out fully to Christ for proclaiming the good news as the sent one of God. 16) Paul also spoke about women serving and ministering in the work of the Church and to the Lord in 1 Cor 7th chapter 34 Verse, he says “...the unmarried woman cares for the things of the Lord…” .In other words Paul was speaking about dedicated women workers who are sold out 100% like him to serve people with the word of God. This gives us an idea that women too served in the Churches in the first century in equal capacity if not less in any way with men. a) Pricilla was called by Paul as my fellow worker (v3). Greet Mary, who Paul says labored much for us (v6). Paul greets the beloved Persis who labored much in the Lord (v12). Paul greets Julia, Nereus [man] and his sister and at the end if this verse he asks the receiver of this letter to greet all the saints [i.e. both men and women in the Church] who were with them(v15). Paul never differentiates between them. b) At the end if the book of 1 Cor 16:19 Paul has written, “The Churches of Asia greet you, Aquila and Priscilla greet you heartily in the Lord, with the Church that is in their house.”Here Paul refers about the coworkers of Paul in their order of authority. Aquila the husband and then the wife Pricilla. This is divine order. Here Aquila and Priscilla were mentioned along with the Church that is in their house, so naturally Priscilla was exercising her gift in the Church but in subjection under her husband in Christ. This is a classical example of a ministry couple working together hand in hand effectively for the extension of His Kingdom (Acts 18:24-26; 1 Peter 3:1-6). c) This is a classical example of a family serving God. The apostle Paul Greets the same couple in reverse order [i.e. Prisca and then Aquila] in 2 Tim 4:19. This shows that when working for God both are equal before God, but in exercising authority over men the Divine order should be followed. This Divine order is what Paul was concerned to implement in the Churches. Some women may be more gifted in a area than their husbands as in the case of Prisca who is more noticeable than her husband Aquila, that does not mean that woman can exercise authority [i.e. to make men accountable for their behavior and discipline them when it is wrong (1 Cor 13:10)] over men. d) God does choose some ladies to lead the Church and it is not an absolute impossibility, but this does not usually happen every time and every place or even equally with men but rarely.“To the elect or chosen lady [The Elder or Leader] and her children…” (2 John 1:1). We can see from the above verse that the elect lady was a married lady with children and is an elderly woman and is not a novice. The very fact that Apostle John was writing this letter to instruct her shows that she too was under the apostolic authority of John the Apostle. To have a clear understanding about women who played important roles in the Old Testament, we should first understand in the context of God’s creation, for what role God has created women when Eve the first woman came in to existence. The word ‘woman’ when it is divided, can be explained as Womb + Man -> Woman. Womb is the part of female’s body where her baby grows before it is born. Man means spirit being or living soul (Gen 2:17). Thus we can safely say that a Woman is a living soul with a Womb. So only when God brought the brand new Eve to Adam, Adam said: “…She shall be called Woman, because she was taken out of Man.” Thus Adam named her as Woman (Gen 2:23). And also Adam called his wife’s name Eve [life or living], because she was the mother of all living (3:20). Woman -> Wo [mb] + man, which also means Womb that produces more living beings. A Woman is the one who was taken out of the Womb [i.e. abdomen region] of Man(2:21, 22). What is the primary reason that God created Woman? What were the thoughts that went through God’s mind about her? God thought that it is not good for man to be alone, this was the reason God decided to make him [Adam] a helper comparable to him (v18). In what way a helper comparable to Adam, if we ask ourselves? Adam himself gives the answer by saying, “This [Woman] is now bone of my bones and flesh of my flesh…” (v23). In other words Adam was saying because God has taken her out of my rib bone and closed up the flesh in its place (v21), she is part of my bones and with that bone joined to my bones I will be complete and she is also the one who represents the flesh that is taken out of my flesh that which is substituted in that area out of which the rib is taken out. So man becomes complete only when he lives with a woman and is committed to her. And he is dependant on her (1 Cor 11:11). Woman is the glory of man(v7), which means that woman is built up by God to act under the authority structure of a man where she will be made complete and will act as the most effective agent of completeness. A woman will find fulfillment of life’s goodness only when she is connected to a man or relates herself to a man [i.e. her husband]. Then this question may come to our mind, what about man? Is he also under any authority structure? Man’s dynamics is that he is the image and the glory of God (v7). Man will find his fulfillment on earth only when he relates himself to God or when he is connected to God and is guided by God. Even angels both good and bad are watching keenly whether this structure of God appointed authority is kept or not. If it is not kept, the same thing that happened to Eve will again happen by demonic intrusion in to their lives. This is why God hates divorce and loves family structure to be rock solid (Malachi 2:11, 14-16). So only we can say, when Eve was tempted by the serpent [Satan], if she would only have had covered her head [i.e. if she had realized she was under Adam’s authority] and if she would have had consulted Adam and Adam in turn if he would have had replied to Satan, “I am under God’s authority, so you better speak to Him before you speak to me,” the fall of man would have been averted. This is the reason the Bible says that woman ought to have a symbol of authority over her, because of the angels (1 Cor 11:10). After the fall of man has happened, God did not ask Eve “Where are you?”, but He asked Adam “Where are you?” as a Head who is accountable to God (Gen 3:9, 10). It was Adam’s responsibility to have informed God when Eve brought the fruit of the tree of knowledge of good and evil for him to eat, instead he heeded the voice of her and ate with out any second thought (2 Cor 11:3; Gen 3:17). The same thing happened also in the life of Abraham when he heeded the voice of Sarai and did not even ask God about it and he got the whole of his family in to trouble and heart break (Genesis 16:1-4). This shows that by creation Adam was created as the head of the woman (Eph 5:23; Genesis 18:19). Satan loves to break the family authority structure, if he is again given an entry by any woman who breaks the structure God has designed. So only a woman ought to realize that she is under authority and should submit to her husband unconditionally (Eph 5:22; 1 Cor 7:4; 1 Peter 3:1-6). 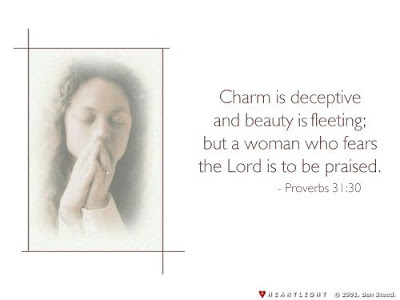 By doing this, even an unbelieving husband may be won to the Lord by the chaste conduct of the believing wife. This is not a custom to be followed or a tradition to keep, but it is a structure that should be maintained and practiced as appointed by God (1 Cor 11:16). a) In the Old Testament, one of the greatest example of submission and gentleness was Sarah. Sarah called Abraham as ‘Lord’ and she always did as directed by Abraham, even at the cost of her own life and security, and God honored her by protecting her from all the dangers she faced (1 Peter 3:6; Genesis 12:17; 20:3, 6). The Holy women will always adorn themselves by being submissive to their own husbands, in that way they will show that they trust in God and His appointed authority structure that He had placed over them. b) In the Old Testament the woman’s role was specified to be a Helper [the same word used for Helper the Holy Spirit in the New Testament (Gen 2:18-John14:26)]. A Helper is the one who helps another person in their work. I. If we ask the question, Can a helper command or rule over the one whom she is under? The answer is no. But because of a good relationship with the one to whom they are helping, they can suggest good things if the person over them wants their suggestion. Helper is a constructive role and not a commanding role (Genesis 21:12; 16:2, 5). II. A Helper will not overrule the decision taken by the authority over them even if it is wrong(Gen 12:10-16). III. A Helper will always be submissive and will always be an encourager if it is a good thing but the Helper does have the right to be quiet and to express her emotions if a decision is wrong (Eph 4:30; Gen 21:9-12 ). IV. A Helper will always have the right to say that something is right or wrong and what will be its consequences (John 16:8-11; 1 Samuel 25:36-38; Acts 5:1-2). V. A Helper will always comfort the one to whom they are helping, irrespective of whether something they have done is a mistake or not on their part (Gen 24:67; 2 Cor 1:3, 4). c) Miriam the prophetess, the sister of Aaron led the women of Israel to praise and worship the Lord with song, music and dance, but the one who exercised authority over men was Moses. Miriam was a leader for women and she displayed her gift wonderfully that which God has given her. When Miriam dissented and criticized against Moses along with Aaron because Moses had married a woman who was of Ham’s descendant. God was not pleased with her and was angry; as a result of it she became a leper. God forgave her because she repented and Moses interceded with God (Num 12). d) Even though Rehab was a harlot when she lived in Jericho, she believed God and helped the spies, not fearing about her own life. Because she received the spies with peace (Heb 11:31), her decision saved her whole family. She was not married at that time, after she was saved, she married Salmon who begot Boaz (Matthew 1:5), thus coming in the lineage of Jesus Christ. e) Deborah was a prophetess and she was judging Israel at that time period in the Old Testament. But still the Bible describes her as the wife of Lapidoth, means that she was under her husband’s authority. Though the children of Israel came up to her for Judgment, still in a family setting she was submissive to her husband. This is absolutely a great example (Judges 4:4). When God spoke to Barak to go to war, Barak wanted Deborah to come along with them to fight the enemies. But she advises Barak to go alone because he will have no glory (Judges 4:9). Here also we see how clearly Deborah understood about God’s authority structure. So only she advised Barak that the Lord will sell the commander and his army in to the hand of a woman and she did not like that to happen, and she wanted Barak to receive the glory of victory that God is going to give. What a submissive woman she was to Divine order! So only God used her! She went to war only as a prophetic guide and spiritual support to Barak. And God worked with Barak and routed the enemies (Judges 4:9, 10). The whole army was under Barak’s command (Judges 4:15-16). God gave victory to the whole country through Barak, under the prophetic guidance of Deborah. f) Huldah was a prophetess during the time of king Josiah’s reign in Judah. Here also the Bible introduces her as the wife of Shallum. The king received God’s guidance through her (2 Kings 22:14, 15). Again here we see Huldah’s submissiveness to God’s authority structure by being submissive to her husband. This also shows that God may use women in leadership position sometimes, but still under a man not independently (2 Chronicles 34:22). g) Prophet Isaiah himself married a prophetess which shows that they [women] also were recognized as givers of Divine counsel to the people, yet with in the Divine order (Isaiah 8:3). Only when this Divine order was broken and disregarded, God was concerned about it because of angels (Isaiah 3:12; 1 Cor 11:10). Once Divine order is broken Satan and his demons can have a free reign in the life and activity of a family, village, town and even nation(Genesis 3:6, 9-12; 16:2, 5-6). When women do not regard Divine authority structure that God has set and if they take leadership positions, a deceitful controlling spirit will take control of them and throw whole thing in to chaos and lawlessness in that place. They will become direct instruments in the hands of Satan and his fallen angels (1 Kings 19:1-2; 21:5-16, 20, 23, 25-26; Neh 6:14). h) Another wonderful example of a prophetess is Anna of whom the Bible says, “And there was one Anna, a prophetess, the daughter of Phanuel, of the tribe of Aser: she was of a great age, and had lived with an husband seven years from her virginity; And she [was] a widow of about fourscore and four years, which departed not from the temple, but served [God] with fastings and prayers night and day. And she coming in that instant gave thanks likewise unto the Lord, and spake of him to all them that looked for redemption in Jerusalem.” (Luke 2:36-38). This shows how she had been married and had been under Divine authority structure before she became a full time prophetess. God, who had seen her wonderful heart of submission, has used her powerfully in prophetic utterance in regarding to the Messiah and His salvation (1 Peter 3:1, 4-5). i) There were female prophetess in the Old Testament, but there were no female priests who taught and ruled the people in the way of the Lord (Deut 21:5; Jer 5: 31; 6: 13; 31:34; Micah 3:11; Lev 21:7), because the qualification for a priest is gender dependant [i.e. male of the tribe of Levi] and this is equal to the fivefold ministry gifts in the New Testament (Eph 4:11-12; 1 Tim 1:1-13; Titus 1:5-9). Where Does women stand in the New Testament? 3) Paul says in 1 Tim 2:13-15, “For Adam was first formed, then Eve. And Adam was not deceived, but the woman being deceived was in the transgression. Notwithstanding she shall be saved in childbearing, if they continue in faith and charity and holiness with sobriety.” Here he is again referring to the authority structure that God had set forth at the time of creation as the standard that need to be looked in to, and the perfect example to be followed in order to be blessed like in the garden of Eden and is referring to the curses that came upon Eve as a result of breaking God’s structure of authority because of Eve’s disobedience first, and then Adam (Genesis 3:13, 16). But Paul says that women will be delivered from curses in child bearing [i.e. labor pain curses will be revoked and good equality in friendship with the husband will happen as a helper], if they [women] continue in faith, love and holiness, with self-control. This also means in other words that women will be delivered from the deceptive scheming of Satan that will bring curse in to their lives, if she comes under the authority structure of the God ordained husband. The family unit walking in faith, love and holiness with self-control is the greatest threat to the kingdom to Satan and his kingdom of deception. 4) The one main first qualification for a Elder who exercises authority in a church is clearly described in Titus 1:6, “If a man [note: not woman] is blameless, the husband [note: not wife]of one wife [not one husband], having faithful children [i.e. having good authority structure in the family]…..” Also in 1 Tim 3:1, 2 the qualification for a bishop is literally given “If any man [note: not woman] desires the position of a bishop, he desires a good work.” God’s divine authority structure is “that the head of every man is Christ, the head of woman is man, and the head of Christ is God” (1 Cor 11:3). As woman came from man, even so man also comes through woman; but all things [whether man or woman] are from God (1 Cor 11:12). All authority is from God. 5) For “A bishop then [secondary qualification] must be blameless, the husband [note: the requirement is male] of one wife….” (1 Tim 3:2). Here also the overseer authority is gender specific clearly in the word of God. 6) “So husbands ought to love their own wives as their own bodies; he who loves his wife loves himself.” (Eph 5:28), because he will be complete only when his bones are all fixed in place and flesh covers it. Let the wives be subject to their own husbands in everything [not only in few areas]. This is why Apostle Paul himself questioned the Corinthian believers in 1 Cor 9:5, “Do we have no right to take along a believing wife, as do also the other apostles, [as] the brethren of the Lord, and Cephas?”. In other words he was telling that all the apostles took their believing wife along with them where ever they went to do ministry, this is the best and a strong foundation for Joyful ministry but they [i.e. Paul and Barnabas] were denying it because of their intense extraordinary zeal (1 Cor 9:6). Paul did not marry because of his own decision to do the ministry without distraction (1 Cor 7:35). This is why Paul was not sure about what he was saying and said “… I think I also have the Spirit of God [regarding this suggestion of marriage]” and has given it as only a suggestion not a command (1 Cor 7:25-26; 40). Even for Paul it was God’s will to get married and do ministry, so only he says, do I have no right to get married (1 Cor 9:5). In other words, he was saying I do have the rights to marry because it is the will of God for every one.